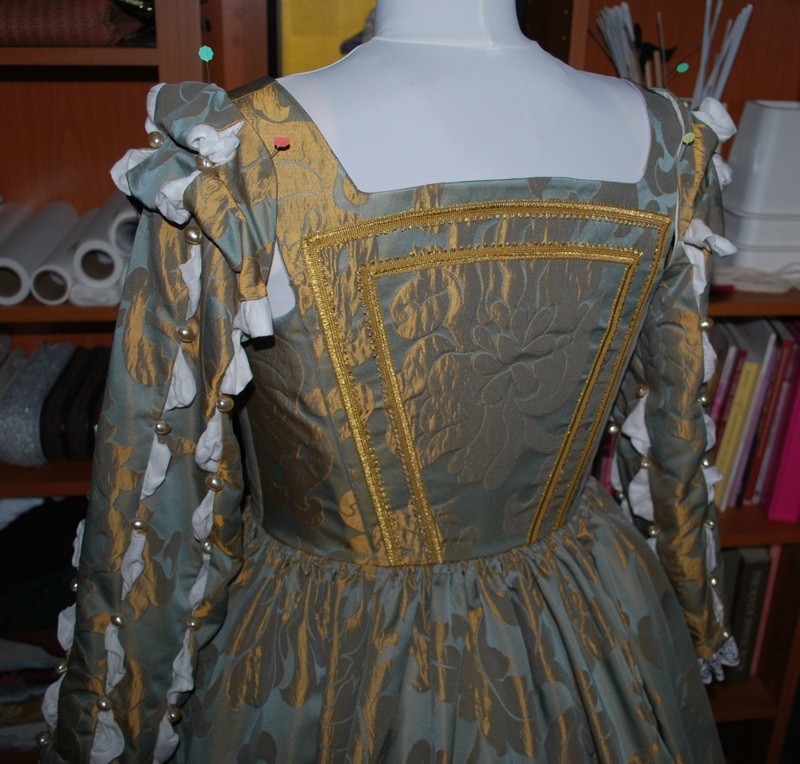 You have not seen the last of this dress, it is not quite finished– but it is done enough for right now. 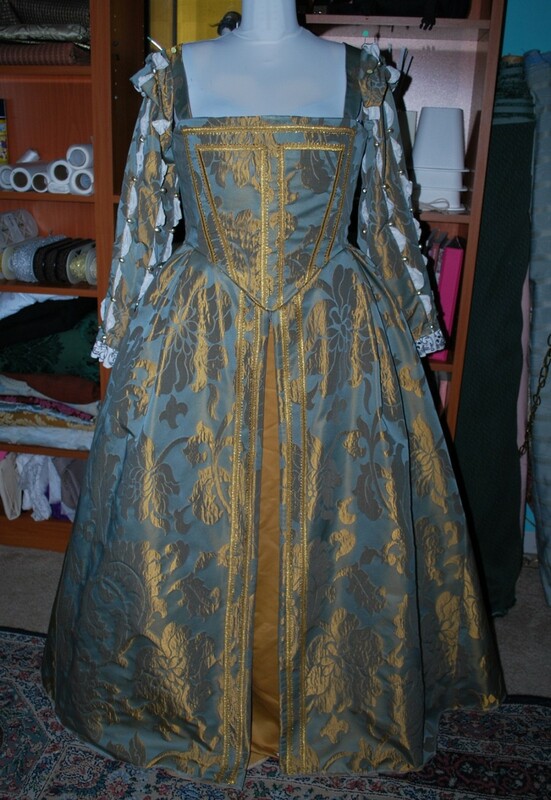 It still needs a smock and partlet, not to mention a final fitting and hand finishing. 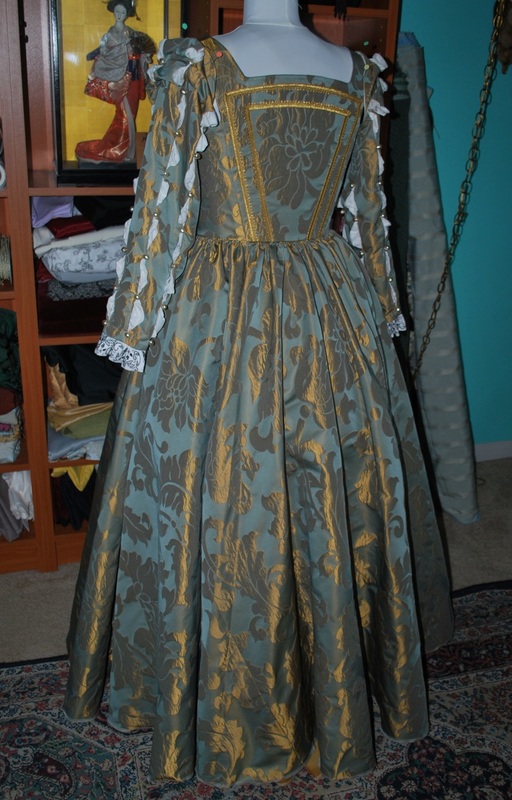 Straps need fitting and attatchment, sleeves need to be whipstitched into place, hemming needs to be done… that will all take place later in the summer, and if I know myself it will be at 11:00 the night before we head to the ren faire. Ha! I really like how the back turned out– loving that gentle arc at the neckline! 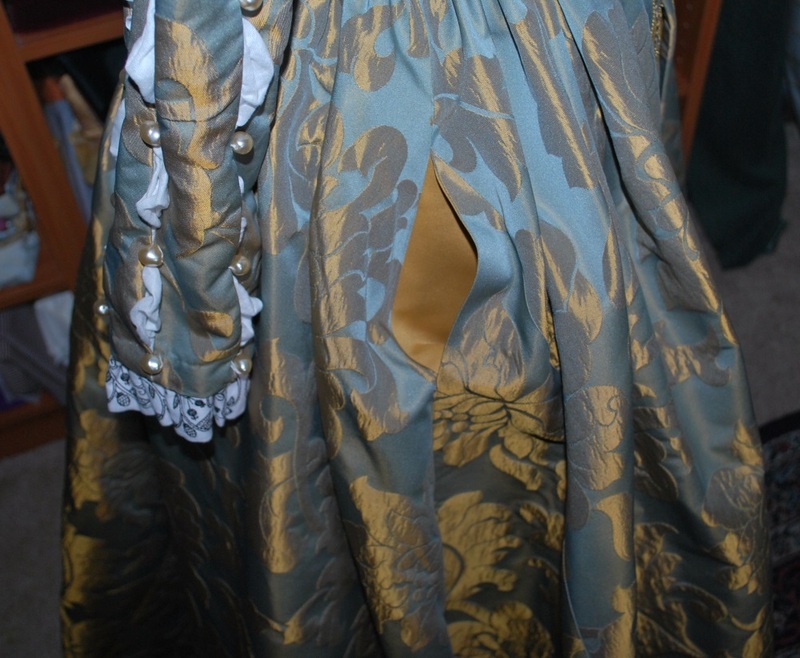 The skirt turned out well, too– a total frankenskirt I pieced together as they did in the days of yore! 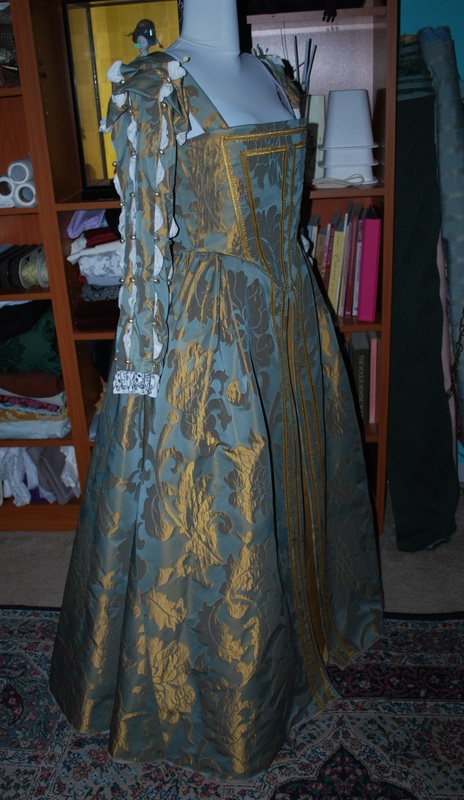 There will be a double row of trim around the hem as well, but that will happen later after I fit the gown. Still need to take out those gathering threads at the waist– whoopsie! 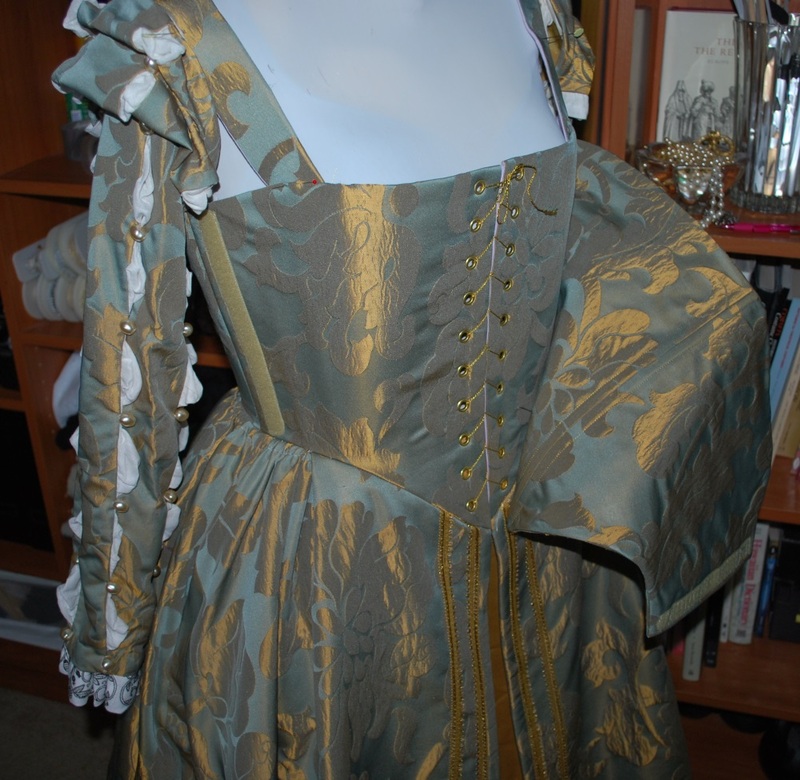 Man, there is still a ton to do on this dress. Originally I was going for the pleated Eleonora look, but my brains have been too harried lately and I just couldn’t get the math right. After a few lame tries, I was all Screw It! I’m gathering! Here is the secret crazy part– avert your eyes, purists! It has a false front that wraps over some center front eyelets. Yes, that is velcro. (Whatever! I do what I want!!!) Actually, there were snaps there, but it ended up too bulky and looked stupid. I replaced it with velcro and now it lays nice and flat, and it’s not obviously a fake seam at all. Plus, it’s just so easy for my SIL to dress and undress herself, which was my goal. –and, there is a secret seam pocket to carry her junk in. I love secret pockets! Obviously, no one is caring about historical accuracy here. This is just a dress to wear to a ren faire, look gorgeous and have some fun! Can’t wait to pile it with pearls!